In today’s modern world, a strong online presence is a critical component of the success of your dental office. People are used to finding information online and many of your patients — and potential patients — will eventually use a search engine to find a dentist or look up your dental office in general. That’s why it’s important for your digital marketing team to understand where your dental office needs to be seen online. The team here at Netmark has found that Google search traffic for the dental industry is pretty evenly split between PPC (Pay-Per-Click) ads, Google Maps and organic search results. What does that mean for you? It means that you need to have a very strong online presence in order to compete. Generally speaking, your online presence should be focused on acquiring qualified traffic to your site from Google and other search engines. Google accounts for over 92% of search traffic worldwide and nearly 87% of search traffic in the United States.1,2 So, where do you need to be seen? On Google of course. 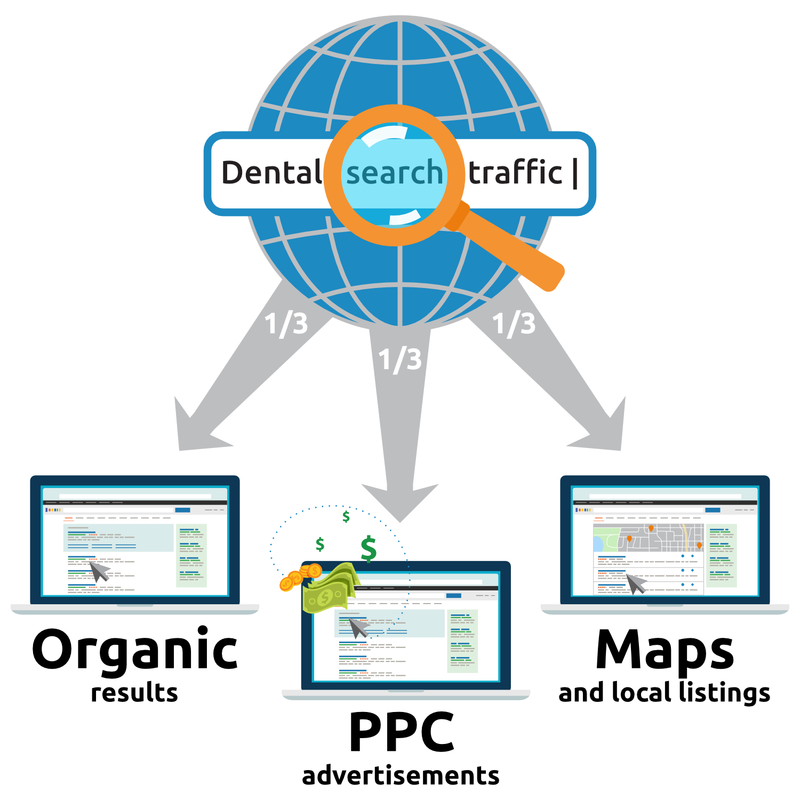 Now, let’s take a look at how PPC and SEO (search engine optimization) can help your dental office be found. Pay-Per-Click is a catchall term used to refer to almost any type of online advertising. This includes Search Engine Marketing (SEM) — the ads found on search engines like Google and Bing — ads on social media sites, and ads on websites. While these systems may seem simple in theory, they actually require an experienced hand to make them work for you and provide you with the highest possible return on your investment (ROI). You’ll be happy to know that the team here at Netmark has spent years learning how to navigate these complex and competitive systems so that you don’t have to. Google Ads or Bing Ads? With an 87% market share, Google is the obvious starting place for your PPC campaign. However, it may be a good idea for your business to run ads on Bing or other search engines if our market research determines that those search engines have a relatively high level of use in your area. That market research is one of the key reasons why you should rely on the professionals to set up and maintain your PPC campaigns. SEO is typically the cornerstone of your digital marketing efforts. It helps search engines know that you are providing your patients (and their customers) with good, reliable information that they are looking for. Successful SEO requires both science and strategy to be effective, and that’s doubly true in a competitive market like the dental industry. hods. PPC results, when properly set up, can be virtually instantaneous. Organic listings, on the other hand, will often take time to come to fruition and will require constant attention to be maintained in the competitive dental market. Organic listings on Google are among the most trusted online results because users have found that Google has delivered high-quality results to them time after time. In order to take advantage of that, you need a digital marketing strategy that can help put your dental office in the top results on Google. Remarketing is probably a term you haven’t heard as much in the digital marketing world. That’s because remarketing isn’t a top-level marketing effort. Instead, remarketing can be used to enhance ALL of your other online marketing efforts. Now, you’re probably asking yourself, “What is remarketing anyway?” Simply put, remarketing is the use of carefully targeted ads to keep your business at the forefront of both their mind and their search for services like yours. Google Display Ads - These graphic ads are found on millions of sites and can reach over 90% of the people on the Internet.3 With careful targeting, your prospective patients may find your company name in front of them across the entire World Wide Web. Facebook Ads - Most people are on Facebook almost daily, so using Facebook Ads to strategically target people who have already shown interest in your company is important. These types of marketing efforts can be used as a traditional advertising touchpoint, of course. But they can also be used for specific retargeting messages. Why Choose Netmark for Dental Digital Marketing? In short, you should choose Netmark for your dental office’s online marketing efforts for one simple reason: We have a system. It’s proven. It works. Over the years, we’ve worked with a wide range of dental offices across the country. As we’ve done so, we’ve been able to develop a proven method for success in the realm of digital marketing for dentists. That means we don’t have to guess. We already know what works in your industry so we don’t have to figure out how to optimize your website and your marketing efforts through trial and error. Let’s take a quick look at what you get when you choose Netmark for your dental digital marketing. Your PPC campaign is optimized and running strong on day 1. We use our proven SEO template to get you strong SEO results much faster than any other digital marketing company. Our Remarketing campaigns are already designed to keep reminding your visitors to call you. Our pre-made offers entice casual site visitors to become clients. Our phone tracking system allows you to track exactly how effective your marketing campaigns are. Our Reputation Management services ensure that your company looks good when people find you online. So, what are you waiting for? Give us a call today and find out how Netmark can help your dental office move to the front of the pack! What Makes Netmark The Best PPC Management Company? Netmark believes that he who has the best information, wins. We collect and analyze more information than any other PPC agency. Netmark has a team of statisticians that have re-engineered various PPC algorithms. We don’t have to guess like other PPC agencies do. Netmark has proprietary PPC management tools that easily outshine the most highly regarded software tools on the market. Netmark generally saves our clients more than what they pay us by eliminating wasteful and unproductive ad-spend. Netmark provides reports and communication on the metrics that truly matter. Netmark’s agreements are Month-To-Month. We have to earn your business each month! The ultimate goal of any Digital Marketing campaign is increasing profits. This can be done by either raising the number of sales, raising the average dollar amount of each sale, or decreasing the costs to acquire each sale. Improving all 3 of those elements can turn what was a small loss in a campaign into massive profits. Netmark has a strong history of being able to improve in each of these areas over time and has been able to significantly improve the ROI of our clients. Netmark is an industry leader in Search Engine Marketing management. Netmark is a Google Premier Partner. Click on the badge to the left to be view our profile.